For the past few days, a clip of Miss Nepal 2019 audition has been going viral in the social media platform. The clip includes the interview session of a participant named, Ashmita Maharjan, by the panel of judges including Rachana Gurung Sharma. Sharma is seen asking Maharjan the reason behind not wearing make up and contact lenses. She proceeds to comment that it was disrespectful of Maharjan to not wear makeup for the audition, even when Maharjan responded that she had mascara on and did not know how to apply makeup. This very clip has the internet divided, majority of audience defending Maharjan and attacking at the ‘hypocrisy of the beauty pageant’, while the rest, including few previous Miss Nepals are defending Sharma and asking viewers to watch the full video first, and not to attack at personal level. The full video of audition shows that the intense question and answer session gets lighter and Maharjan was chosen for the next level of competition. However, Nepali audience were quick to question on the concept of beauty pageants. They came to social media to express their disappointment on the preference of outer beauty over inner beauty and talent. The internet users called out the beauty pageant, Miss Nepal, for being the opposite of women empowerment and degrading women. An online petition has been filed by Avishek Sanjel Chhetri requesting for boycott of Miss Nepal 2019 and states, “Rachana Gurung Sharma should publicly apologize to the contestant member and resign immediately as a judge on the Miss Nepal pageant.” The petition has been signed by more than 2100 in two days. Sharma has found herself in hot water after the clip went viral, she is being trolled and memes are heavily circulating in Facebook and Instagram. On the other side, previous Miss Nepal, Malvika Subba, supported Sharma by making a post in Instagram. In the post she mentioned that it was Rachana Gurung Sharma who advised her to wear a simple make up and focused on inner ability when she was a part of the pageant in 2002. Further she defended Sharma by stating that it is the need of the time to look good on outside as well. In the same post, she also accepts that she does not correlate with the beauty standard set by the pageant. Shrinkhala Khatiwada, the reigning Miss Nepal, posted a bare face selfie with #nomakeupandstillbeautiful caption after the viral clip. After a day, she made another post in Instagram accepting there is a problem with the concept of beauty pageant but asked to stop bullying an individual. 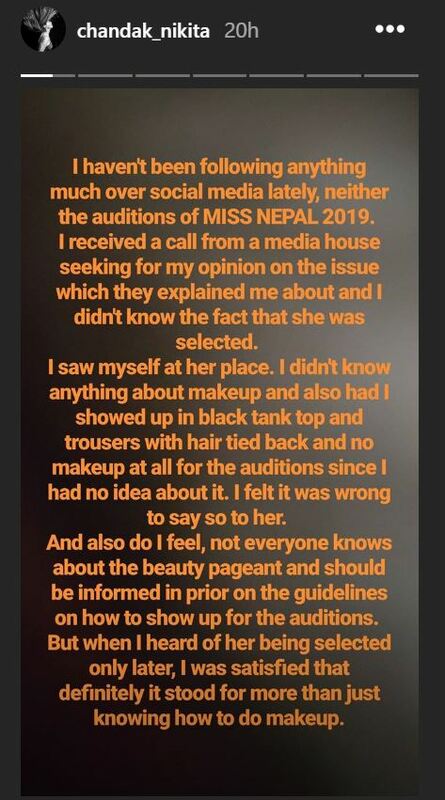 Nikita Chandak, Miss Nepal 2018, posted an Instagram story, where she wrote the fact that she also showed up for her audition without any make up. She also emphasized that participants should be notified on how to appear for their audition. Rachana Gurung Sharma has been the official choreographer since the inception of Miss Nepal in 1994. Miss Nepal is organised by The Hidden Treasure. Hate is not a solution to anything. We need to think deeper. Act wiser. Social media is a powerful place. Let’s use it to make things better!